So often, saying (or not saying) the right word can transform a situation, and this empowering resource aims to give speakers the life-changing secrets of effective communication. 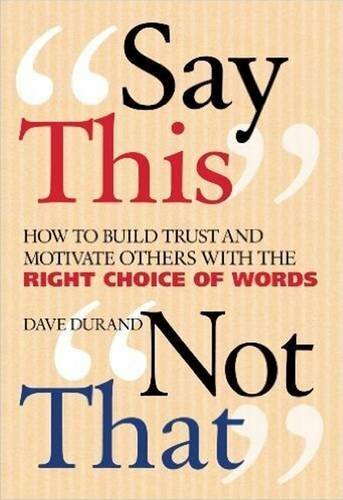 Drawing from his experiences training more than 100,000 managers, Dave Durand offers specific, detailed suggestions for what to say in a variety of everyday situations, as well as surprising information about the hidden meanings that makes some key words so powerful in conversations. Using simple, proven techniques, this resource covers important subjects such as building trust, inspiring others, correcting behaviors, raising standards, holding someone accountable, making first impressions, apologizing, encouraging open communication, reporting bad news, and making a point amidst adversity. If you have any questions about this product by Crossroad Publishing Company, contact us by completing and submitting the form below. If you are looking for a specif part number, please include it with your message.